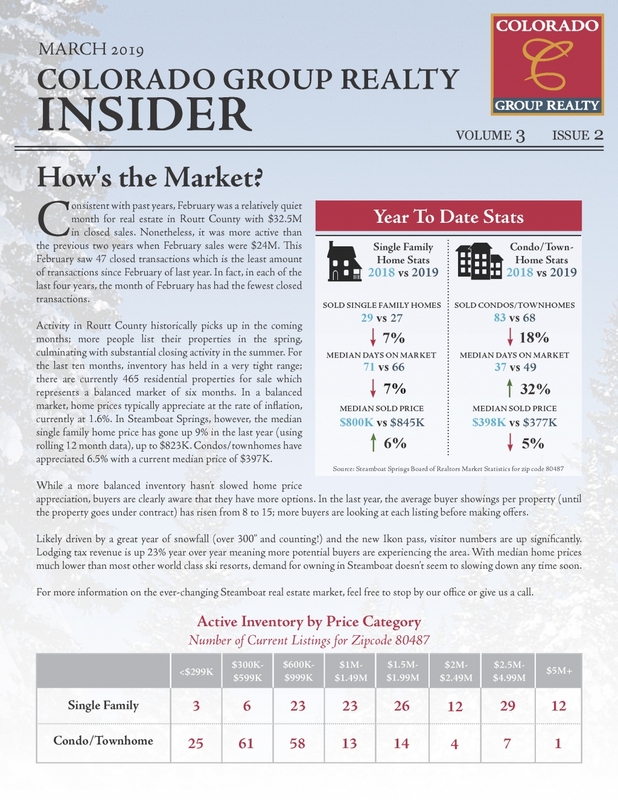 Consistent with past years, February was a relatively quiet month for real estate in Routt County with $32.5M in closed sales. Nonetheless, it was more active than the previous two years when February sales were $24M. This February saw 47 closed transactions which is the least amount of transactions since February of last year. In fact, in each of the last four years, the month of February has had the fewest closed transactions. Activity in Routt County historically picks up in the coming months; more people list their properties in the spring, culminating with substantial closing activity in the summer. For the last ten months, inventory has held in a very tight range; there are currently 465 residential properties for sale which represents a balanced market of six months. In a balanced market, home prices typically appreciate at the rate of inflation, currently at 1.6%. In Steamboat Springs, however, the median single family home price has gone up 9% in the last year (using rolling 12 month data), up to $823K. Condos/townhomes have appreciated 6.5% with a current median price of $397K. While a more balanced inventory hasn’t slowed home price appreciation, buyers are clearly aware that they have more options. In the last year, the average buyer showings per property (until the property goes under contract) has risen from 8 to 15; more buyers are looking at each listing before making offers. Likely driven by a great year of snowfall (over 300” and counting!) and the new Ikon pass, visitor numbers are up significantly. Lodging tax revenue is up 23% year over year meaning more potential buyers are experiencing the area. With median home prices much lower than most other world class ski resorts, demand for owning in Steamboat doesn’t seem to slowing down any time soon. For more information on the ever-changing Steamboat real estate market, feel free to stop by our office or give us a call.